Daniel was Nylon magazine's front desk receptionist (filled in for Lauren Adler) at their office in New York, US for an hour. Nylon did release their hidden camera video today and it also features singer and actor Joe Jonas. This prank (none of the staff was made aware that he would be there) video was created by Josh and Vince. 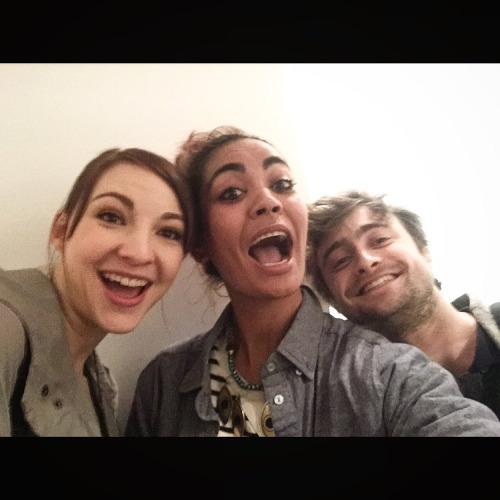 A few weeks ago, Daniel Radcliffe stopped by the NYLON offices and sat at the front desk, unbeknownst to staffers and office visitors. The following was written by a NYLON employee, who wishes to remain anonymous. This is her tale. It was a Thursday afternoon, just like any other. I was sitting at my desk, tired and a tad despondent, when I decided to "stretch my legs." And by that, I mean grab a bag of Cheez-Its*. As I turned the corner to the lobby, I was blinded. The pink neon NYLON sign had been cooking for hours, and it was very bright. I reached around the desk, grabbed a bag, and made my merry way back to my desk. As I walked back, out of the corner of my eye, I saw that there was a man sitting at the desk. I turned my head, and, to my delight, I realized that my peripheral vision had not failed me. It was Daniel Radcliffe sitting at the front desk. 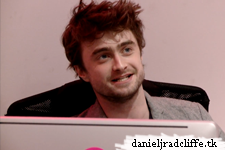 Yes, that Daniel Radcliffe. Confused and more than a bit dazed, I stared for a moment before accepting this fact and returning to my desk. Staring at my computer screen, I thought: That was strange. Was I supposed to say something? Should I say something? Probably not. Then, out of the corner of my eye, I noticed another sight. It was an intern, crying. My peripheral vision was not failing me that day. They were tears of shock and, I think, joy. I looked around and I saw a lot of smiling, blushed faces. They had all "happened" to walk by the lobby. And while some of them engaged with the actor, some of them chose to play it cool and freak out later. I received no phone calls during that hour, which was strange. And a package that was supposedly delivered to the office for me never made it to my desk. As I started to track down the aforementioned package, I heard a squeal. Apparently Joe Jonas had come into the office, to surprise Daniel and try to resume his job. Some may call it magical, making an all-too expected allusion to Harry Potter, and others may call it unbelievable, but I would like to sum it up as "a really strange, star-studded day." And thankfully there is this hidden camera video to prove that it existed. *Cheez-It does not, and has never, sponsored NYLON in any way. That being said, they should. Cheez-It, feel free to reach out.